Allergic dermatitis is a rash caused by an irritant coming into contact with the skin of an animal, and it is the most common complaint veterinarians in North America receive relating to skin disease (Kuck). Itchy Dog was developed in response to the demand for a product that would help naturally manage the symptoms associated with allergic dermatitis. It utilizes ingredients like vitamin E, vitamin A, and zinc, which have been shown to encourage healthy skin and support the management of skin disease (Burns). Additionally, Itchy Dog uses omega-3 and omega-6 fatty acids, which have been shown to have a beneficial effect on skin issues (Finch). Furthermore, deficiencies in either omega-3 or omega-6 fatty acids can result in an array of skin disorders from loss of skin elasticity, to scaly skin, to a dry and dull coat of hair (Burns). Vitamins, minerals, and fatty acids can be found in almost all supplements aimed at improving skin disorders, but only Itchy Dog uses bioflavanol, spirulina, and α-lipoic acid. Bioflavanol is an extract of oligomeric proanthocyanidins (OPC’s) from grape seeds. It is an extremely powerful antioxidant, and research has shown bioflavanol to have a protective effect on allergic dermatitis (Tang). Grape seed extract is also very safe for dogs, unlike whole grapes. Grape seed is recommended by many veterinarians as a safe and effective antioxidant. Spirulina, a well-known superfood, is a complete protein that also contains many vitamins and minerals. On top of that, spirulina has been shown to stimulate the production of antibodies and manage histamine effects (Kuck). α-lipoic acid is also a strong antioxidant, which has been shown to be effective in helping allergic reactions (Venkatraman). A clinical trial report was done on the effects of Itchy Dog on dogs with allergies. At the end of the trial, 97% of the dogs were reported to have had some type of improvement, and 67% were reported to have had either good or excellent improvement in their condition after the trial (Mulnix). Below is a graphical representation of the breakdown in improvements observed in the dogs. 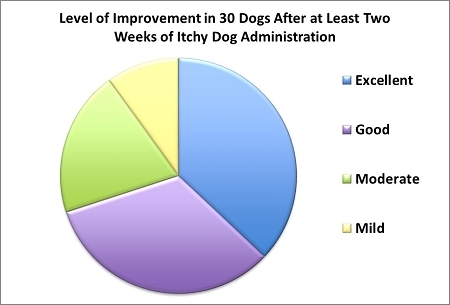 As the clinical trial report showed, Itchy Dog is very effective at helping animals that suffer from allergies. It is the use of unique ingredients like bioflavanol, spirulina, and α-lipoic acid in combination with the better-known ingredients like vitamin E, vitamin A, omega-3/6 fatty acids, and zinc that make Itchy Dog so successful. Burns, Kara M., MS, MED, LVT. "Nutritional Management of Inflammatory Skin Disorders." Veterinary Technician (2005): n. pag. VetFolio. Web. Finch, Justin, MD, M.N. Munhutu, and Diane L. Whitaker-Worth, MD. "Atopic Dermatitis and Nutrition." Clinics in Dermatology 28.6 (2010): 605-14. Web. Kuck, John. "Nutrient Selection in the Management of Canine Atopic Dermatitis." Studies on Veterinary Medicine. New York: Humana/Springer, 2011. 153-60. Print. Mulnix, J.A. Proanthozone Derm Skin, Coat &Allergy Formula Clinical Trial Report. Golden, CO. 2008. Tang, Qiuqiong, Peng Zou, Haifeng Jin, Jun Fu, Jintao Yang, Lanqin Shang, and Xuetao Wei. "Grape-seed Proanthocyanidins Ameliorate Contact Hypersensitivity Induced by 2,4- dinitrofluorobenzene (DNFB) and Inhibit T Cell Proliferation in Vitro." Toxicology Letters 210.1 (2012): 1-8. Web. Venkatraman, Meenakshis., Amar Chittiboyina, Josef Meingassner, Christopheri. Ho, James Varani, Charlesn. Ellis, Mitchella. Avery, Harrihara. Pershadsingh, Theodorew. Kurtz, and Stephenc. Benson. "α-Lipoic Acid-based PPARγ Agonists for Treating Inflammatory Skin Diseases." Archives of Dermatological Research Arch Dermatol Res 296.3 (2004). Web. This month we will continue our three part series on spring turkey hunting. I will provide some suggestions as to what to carry in your turkey vest, discuss the importance of decoys and proper set up and give you some field tactics to help you become more successful. . .